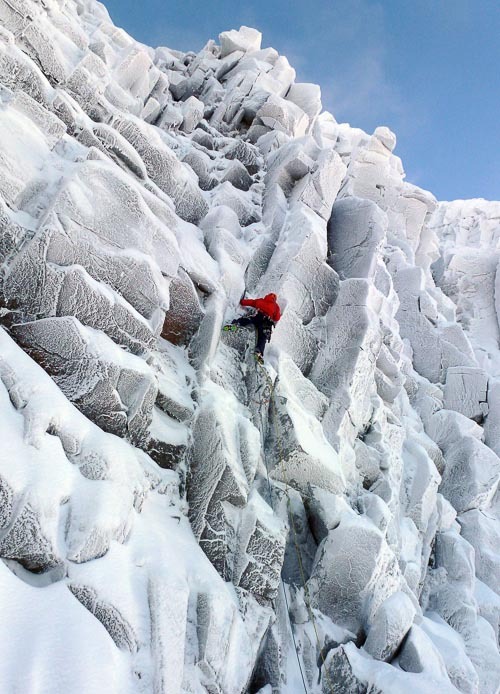 “OK, you need to count variations to make that true, but the three figures for Lurcher’s Crag has come a lot closer this week during snowy conditions when all the steep walls have been rimed,” Andy Nisbet writes. “In the 1960s and 1970s, only the main gullies were of interest. Surprising really when climbers had done Moderate routes in summer way back. But I guess it was a remote crag until the ski road was built. Then John Lyall started exploring in the 1990s and discovered the amphitheatre at the southern end of the crag. He climbed routes at each end but failed to get up the main wall. I started exploring Lurcher’s in 2007 and climbed many of the long mountaineering style ridges. In 2009, John took me to the central gully in the amphitheatre, and finding unusually icy conditions, we managed to struggle up it (Wolfstone Gully – VI,7). There were so many easier lines to do, and the amphitheatre had an intimidating atmosphere, so I didn’t return until this winter. With Steve Perry and Jonathan Preston in mid November, we climbed an easier line which didn’t touch the main wall but gave us a good look at the potential – Pegleg (III,4). I’m just getting back to reasonable fitness, so Jonathan Preston and I waited until last week to try something steeper. John Lyall’s Collie’s Route (IV,5) was an old attempt on Wolfstone Gully but they had been forced to traverse away across the face on the right to find an easier way up. I was a bit surprised he hadn’t gone back to do a direct start, but I guess there was lots to do. Steve had decided his peg leg should be rested for the winter, so Jonathan and I decided to try the direct start with the hope that we could continue up the headwall. Also there are loose blocks on the wall so we had to wait for properly cold conditions. But we did climb Collie’s Ridge, the right bounding ridge of the amphitheatre, so we could have a good look at the potential route, and we decided on a good line for the start. It looked like steep slabby ground with occasional turf. On February 2 we were back and delighted that the wall was pure white, but not deeply buried. Jonathan volunteered to lead the start, leaving me to find a line up the headwall. The pitch was sustained after an introductory squeeze chimney, which took as much effort as the rest of the pitch. He had to work for runners but the effort produced reasonably good protection. He belayed on the big traverse ledge of Collie’s Route under a cracked groove. There didn’t seem to be any footholds in the groove, so I nipped round the corner to a much friendlier ramp, which led up right to a pinnacle. Standing on the pinnacle was very precarious and distinctly committing but the smooth vertical wall above it had a brilliant crack, which had no right to exist. Having filled it with more runners than were really necessary, a wild move gained a ledge complete with a knob of rock, a unique feature which even took a sling runner and which allowed a swing left to the foot of a ramp. The ramp led more easily up the headwall to a chimney, which broke its capping bulge. This left Jonathan to finish up a short technical groove to reach upper Collie’s Ridge. We were both delighted with this spectacularly exposed and improbable pitch up the headwall. Jonathan compared it to the crack on The Migrant (Coire an Lochain), so that made the decision to similarly grade it VI,7 ***. I have a feeling it might be quite a soft touch but folk don’t usually complain. It was called Rottweiler, along with the dog theme but requiring an aggressive touch (and Jonathan said he used to be nicknamed The Rottweiler). Sandy Allan had a Polish visitor, Kacper Tekieli, staying for a few days and had suggested that we could point him at something new, which we wouldn’t try ourselves. He had turned down an invite to the Polish winter K2 expedition so he might cope with the Lurcher’s headwall. The plan was a rib at the left end of the headwall. I had sussed out a line of least resistance (i.e. one that Sandy and I would enjoy), so we pointed Kacper at a slabby corner, which formed its left side. This was rather lacking in footholds but had just enough turf and protection for Kacper to climb it steadily. The next and much easier pitch took the right side of the rib, with the final pitch again on the left side. It was nice to walk in and out from the crag in daylight, the advantage of accessible Lurcher’s. We called it Wolf Whistle, but the grade wasn’t so easy, Sandy and I not having climbed as hard as that for a while and Kacper not knowing Scottish grades. Apparently it was Tatra 7, so Scottish VII,7 seemed to fit. This entry was posted in New Routes and tagged Andy Nisbet, Jonathan Preston, Kacper Tekieli, Lurcher's Crag, Sandy Allan. Bookmark the permalink.